After a few iffy efforts—at least by its own lofty standards—Pixar follows the marvelously mind-bending Inside Out with a Mexico-set adventure that bubbles with wit and daring. Effortlessly gliding between kid-friendly spectacle and heart-tugging emotion by way of surrealist touches and a hilariously specific recurring joke about Frida Kahlo’s unibrow, Coco is a goofy joy from start to finish. 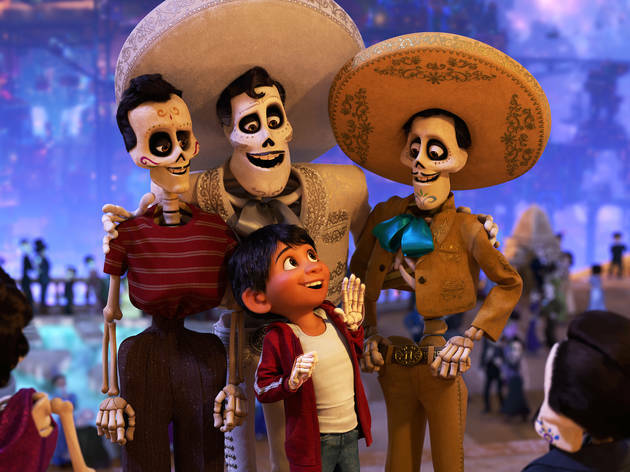 Committing full bore to its setting—Mexico’s Day of the Dead festival—Coco introduces its hero, 12-year-old Miguel (voiced by newcomer Anthony Gonzalez), as a frustrated musician growing up in a family where music is banned. On the eve of the festivities, he pays a visit to an ofrenda, his clan’s ancestral altar, where an encounter with a magical guitar sends him spinning into the afterlife on a quest to find his great-great-grandfather, a puffed-up matinee idol, and win his blessing to become a musician. Cue songs, color and a shady prankster called Héctor (voiced by Gael García Bernal) with a speciality in physical comedy. There’s a scrappy canine sidekick, skeletons galore and beautifully imagined barrios crammed into this undead fantasia. It’s a glorious tribute to Mexican tradition that tips a sombrero to the animated work of Ray Harryhausen and Hayao Miyazaki, too. The story occasionally seems a little too deferential to its folkloric inspirations. Giant spirit animals swoop in and out of the action, shifting characters from A to B a touch too conveniently. They feel like they belong in a different movie—they might be more at home in a silly fantasy alongside the eagles from The Hobbit. These are smallish grumbles, though. In the spirit of writer-director Lee Unkrich’s last movie, Toy Story 3, genuinely tough themes are tackled (illegal immigration and dementia) without the mood ever souring. If it’s a tier below the studio’s very best, its freshness still bodes well for Pixar’s future. As sweet as sugared churros and as vibrant as a fiesta, Coco is a charm. This is a really sweet story and personally for me fascinating as where my relatives come from, also emphasises the importance of remembering your ancestors. 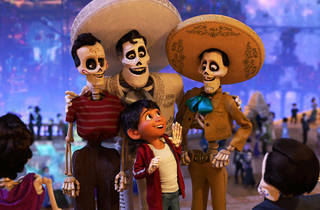 I think the Day of the Dead is really cool, so this movie had a really interesting theme. The plot was thoughtful and had an interesting twist. I had to admit I did shed a tear for Hector (but I cry at anything). And the family affection to Coco was heartwarming. This movie is straightforward story telling. There are no clever hidden jokes for the adults. It's a great movie to watch with the kids, it's bright, colourful and has an imaginative story.